Introduction: Although surgical treatments remove the offending stone, do little to alter the course of the disease. The incidence of stone disease is on the rise, a thorough understanding of the etiology, epidemiology and pathogenesis of urinary tract stone disease is necessary so as to develop an effective medial prophylactic program. We took up this study to analyze geographical factors, diet, body mass index (BMI) in patients from North West Karnataka, South coastal Maharashtra and Goa. Materials and Methods: Patients with renal stones for surgical management at our hospital formed study group. A detailed history of these patients was recorded. The patient's data in relation to diet, BMI, urinary pH, chemical composition of the stone were collected and analyzed. Results: A total of 250, of these 160 patients were from north western Karnataka, 43 from the state of Goa and 47 were from south coastal Maharashtra. Male: Female ratio was 2.33:1. When compared with patients from North West Karnataka and South coastal Maharashtra the mean BMI of the patients from Goa was significantly high, P < 0.042 and < 0.00000035 respectively. The mean urinary pH of urine was significantly lower in patients from Goa when compared with patients from North West Karnataka, and South coastal Maharashtra that is, P < 0.009 and < 0.022 respectively. Twenty-nine (11.6%) patients were diabetics, and the percentage of diabetics was similar from all the three regions. The incidence of uric acid calculi among the diabetics was high in patients from South coastal Maharashtra (50%) and Goa (60%). Conclusions: Nonvegetarian diet was most commonly seen amongst patients from Goa (74.4%) and south coastal Maharashtra (65.6%) when compared to patients from North West Karnataka (38.2%). Calcium stones were the most common in all the three regions, though the incidence of uric acid calculi was the highest in patients from Goa (37.3%). The urinary pH was significantly lower in patients from Goa when compared with patients from North West Karnataka and South coastal Maharashtra. The purpose of this review was to address current psychosocial therapeutic techniques which reduce family care burden in psychiatric disorders. Various types of psychosocial/psychotherapeutic techniques have been developed to reduce the family burden in key caregivers and to provide support. These techniques include training programs, spiritual support, religious coping, psychotherapy, cognitive-behavioral family intervention, enhancing social support, and a combination of education and emotional support. A number of pathologies is encountered in inaccessible areas of head and neck region such as lesions in the cranial base, orbital or deep nasal cavities and also in deep spaces of the neck. The diagnosis of such deep lesions has been revolutionary due to the advance in technologies in the field of radiology. The surgical treatment of these lesions poses a significant challenge to the operating surgeon due to anatomic complexity, difficulty in access, and surrounding vital structures. A team approach is often necessary for complete removal of the pathologies without damaging the vital structures. Access osteotomies are routinely performed for improved access to such lesions. In this, osteotomy of the maxillofacial skeleton is carried out, and repositioning of the bony skeleton is done after removal of the associated lesion. Lateral orbital osteotomies are used for improved access to deep orbital tumors. After original description of this technique by Kronlein, various modifications have been introduced by different surgeons. We present a new technique of lateral orbital osteotomy in which a pedicle is maintained for improved blood supply and faster healing of the osteotomized segment. This osteotomy technique provided satisfactory exposure of the lesion and was fixed with miniplates resulting in esthetic reconstruction of the facial morphology and function. This method enabled us to decrease the morbidity and hastens healing without compromising on the advantage of good access. Background: Practicing evidence-based approach has been widely promoted in medicine although this has been to a lesser extent in dentistry. The present study is aimed at assessing the knowledge and attitude of postgraduate students toward evidence-based dentistry. 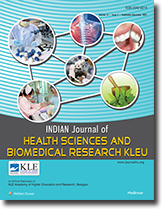 Methodology: The study sample consists of 71 postgraduate students of Mamata Dental College, Khammam. An 11 item multiple choice, close-ended questionnaire was designed to assess the knowledge and attitude of the postgraduate students toward evidence-based dentistry. The results were expressed in percentage and counts. Results: About 49.3% of the students are unaware of evidence-based dentistry, and 29.5% students could apply the concept. About 80% of the students are interested in finding information about evidence-based dentistry and 33% of the students agree that the evidence-based dentistry provides best decision-making skills. A total of 76% of the students agreed that it improves skills in clinical performance. Conclusion: The findings of this study state that there is a need of evidence-based methods as they are the upcoming methods of dentistry. Lack of confidence and availability of resources are important barriers in practicing evidence-based dentistry. Introduction: The word hydatidiform means drop of water and mole is a shapeless mass. It is an abnormal placenta having enlarged, edematous and vesicular chorionic villi accompanied by variable amount of proliferative trophoblast. It is of two types complete and partial. The diagnosis is based on clinical findings, biochemical markers like human chorionic gonadotropin (HCG) histopathology and genetics. The objective of this study was to determine the frequency, clinical presentation and significance of HCG and histopathology in the diagnosis of hydatidiform mole. Materials and Methods: Results were measured in terms of age of patients, gestational age, clinical details, investigations specially HCG, histopathology. Results: Totally 67 specimens were examined and diagnosed, which included 37 cases of complete and 30 cases of partial mole. The common age of patients with complete hydatidiform mole was above 35 years whereas 21-35 years with partial hydatiform mole. Most presenting complaint was bleed/vaginum. Conclusion: Complete mole was more frequent. Histopathological examination along with clinical findings and HCG is mandatory to differentiate Complete and Partial Mole. The clinical findings may overlap due to earlier removal of hydatiform mole before the clinical symptoms develop even after expulsion of the fetus both of which may result in a false diagnosis. We concluded that there is no single criterion to differentiate Complete from partial mole. P57kip2 expression will complement histopathological evaluation in the diagnosis of difficult cases. Context: This is a retrospective study done using data of population-based cancer registry (PBCR) Gandhi Nagar district for the years 2009-2011. Aims: The aim was to describe the impact of tobacco-related cancers (TRCs) on incidence and mortality due to cancer and its gender wise distribution. Subjects and Methods: Cancer incidence and mortality data for 3 years viz. 2009, 2010 and 2011 was used. A total of 980 TRC incidences and 350 deaths was registered. Statistical Analysis Used: All results were derived using appropriate statistical software and appropriate statistical tests. Results: Totally, 980 cases were included. Of them, 787 (80.31%) were males, and 193 (19.69%) were females showing higher male preponderance. Most common TRC in males and females was oral cavity 25.41% and 24.35%, respectively. There were 350 deaths due to TRC. Of them, 279 (79.71%) were males, and 71 (20.29%) were females showing higher male preponderance. Male: female ratio was 4.08:1 for incidence and 3.93:1 for mortality. Major proportion of the incidence and deaths were in the age group of 35-64 years. Most common TRC deaths in males were due to tongue (23.30%) and in females due to esophagus (25.35%). Conclusions: The high prevalence of TRC observed shows a serious concern about occurrence of disease and risk factors related to these cancers. Tobacco is a major risk factor for cancer, and it is significantly high in males than in females. Therefore, this study reveals an urgent need for tobacco control and other preventive measures like cancer awareness programs at community level. Introduction: The detection of elevated BP during pregnancy is one of the major aspects of optimal antenatal care,and thus accurate measurement of BP is essential. Methods: To evaluate whether there is a significant difference in inter-arm blood pressure (BP) measurements among normotensive low-risk primigravidae as an observational study was conducted at Yediur Municipal Maternity Corporation Hospital, Bangalore. A total of 100 low-risk women at 6-14 weeks of gestation attending antenatal clinic was selected by purposive sampling technique. Bilateral BP was measured by a calibrated Normal mercury Sphygmomanometer during the initial antenatal visit and the subsequent 2 months visits. Mean Inter-arm systolic blood pressure (SBP) and diastolic blood pressure (DBP) differences were computed for each visit and the three pairs of readings were averaged to obtain a mean SBP and DBP for each arm to derive the mean inter-arm difference. Results: The results revealed a significant difference in the mean SBP in right (115.71 ± 0.827 standard deviation [SD]) versus left arm (105.23 ± 1.110 SD) and the mean DBP in right (73.10 ± 0.370 SD) versus left arm (69.43 ± 2.288) at P < 0.001. For SBP, the mean difference between the right and left arm was 11.87 mmHg, and the normal range was 2 mmHg to 16 mmHg. For DBP, the mean difference was 6.09 mmHg, and the normal range was 0 mmHg to 10 mmHg. Twenty-one (n = 21) primigravidae had clinically important differences >10 mmHg in SBP and DBP between their arms. None of the maternal characteristics were a significant predictor of inter-arm SBP and DBP differences at P > 0.001. Conclusion: Assessment of bilateral BP should become a routine part of cardiovascular assessment of pregnant women in primary care to determine whether the risk to the pathological condition is present. A mandibular molar with more than four canals is an interesting example of anatomic variations. This case report describes a mandibular first molar with six canals, three canals located in the mesial root and three canals in distal root. The canals were instrumented with rotary system and irrigated with NaOCl (5.25%) and normal saline as the final irrigant. The canals were filled with gutta-percha (Denstply, Maillefer, Switzerland) and AH-plus sealer (Dentsply DeTrey GmbH Konstanz, Germany). This case shows a rare anatomic configuration and points out the importance of search for additional canals. Introduction: Teaching is a process that facilitates learning by encouraging learners to think, feel, and do. Teaching-learning mechanism plays an important role in institutions in determining the effectiveness (quality) of the output in health care profession and not the efficiency (quantity) alone. The learning process should never cease, as in the present era of information explosion teachers have to keep themselves updated with the newer trends in science and technology. However, with vast technological aids advancement and material science available to us, we still stand in dilemma at times introspecting as to "How refined is our teaching and is our professional education appropriate to bring about changes effectively and efficiently." Hence, this paper aims at amalgamation of transformations that have taken place in teaching-learning and the effectiveness that is bought about in teaching. Materials and Methods: A questionnaire study is planned in health science institutions mainly medical and dental by using specifically designed validated questionnaire that has both open and close ended questions. Teachers in academics for more than 5 years were included. Results: About 98% of teachers said that they prioritized their teaching according to the learners group. Though oral communication has been the mode of teaching and interacting, 38.9% of them use a combination of different aids while teaching. About 76.1% felt that teaching is what the students should be able to do rather than what the teachers can do. Moreover, 94% of teachers were of the opinion that the traditional role of teachers has changed over the years. Conclusion: Teaching is a skilled professional activity carried out by a complex being (i.e. teacher) for more complex being (i.e. learners) in complex situations (i.e. classrooms, wards, OPD and hence planning is critical irrespective of the number of years and hours that we have put in teaching and the mode by which we are teaching. Scientific research in the area of medicine and public health has resulted in remarkable achievements and major reforms in the health sector and the overall progress of the health care in the last century. Predominantly research methodologies have been categorized into two major areas namely quantitative and qualitative research. Qualitative research is a special form of social enquiry that focuses on the way people interpret and perceive their experiences. Apart from exploring different facets of research, it also provides complementary information to the results of the quantitative research methods. Altogether, qualitative research methodologies can be applied in variable health settings with an aim to assess the human behavior and thus help policy makers to plan and implement appropriate measures to combat public health concerns.